Most practitioners are aware of the negative effects of excessive alcohol use and how it affects the overall health of their patients. 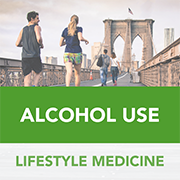 Hesitation in fully addressing alcohol use results from alack of knowledge ofkey definitions concerning alcohol use and a lack of understanding ofeffective interventions that can be applied in primary care settings. Limited practice conducting patient screenings and interventions is also a problem. With increased knowledge and competence in performing assessments and interventions, more clinicians, including primary care providers, will be able to best address risky alcohol use with patients.